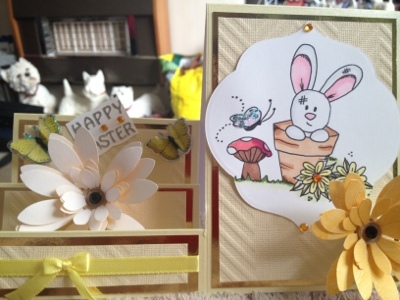 This weeks challenge is Easter at glitternsparkle. The image is called Toby in pot from crafty sentiments. I coloured him in with my spectrum noir pens. And used glitter for the butterfly. I used yellow pearlised card and made it into a stepper card. And used gold mirri card and cream coordinations to layer it. The sun flowers are made by using the die'sire large and small sunflower quilling die and the stamen. The butterflies are stickers that I have had for a long time. And I used yellow ribbon and orange gems. This is gorgeous and love that image. Gorgeous image and a fabulous side stepper card. Love your side stepper card, cute image and great flower. Love this so sweet image. What a lovely easter card. I love stepper cards and you have evened out the sides perfectly with that gorgeous flower.